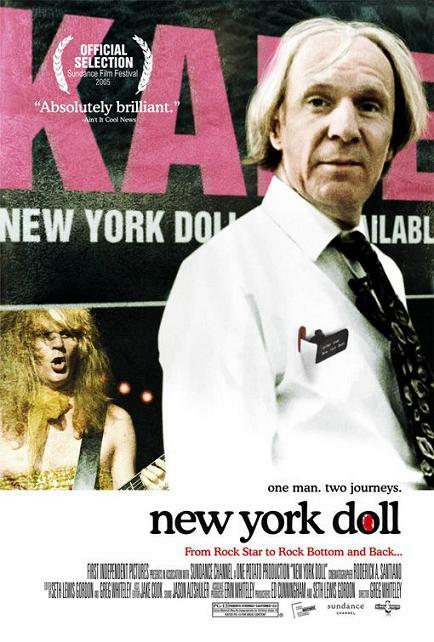 Release Date: October 28th, 2005 (NYC- Angelika Film Center) by First Independent Pictures. BASIC PREMISE: A documentary about Arthur “Killer” Kane, a bass player for the New York Dolls, reunites with his band 30 years after they broke up in the 1970’s. ENTERTAINMENT VALUE: The New York Dolls were, in many ways, revolutionary in the way they presented rock music with the band members in weird outfits and make-up. Director Greg Whiteley does a great job of presenting the viewer with enough details about Arthur “Killer” Kane to make him into complex, quirky, and very appealing human being. Although his looks and fashion were mediocre, he has a very charismatic personality. He was much more than a bass player for the New York Dolls. Eventually, he was also a Mormon who volunteered at the Family History Center—the funny old ladies at the center recall how much they loved working with him. He was an alcoholic for many, but later recovered from it. The very direct interviews with him in 2004 generate a lot of warmth and show just how wonderfully strange he was. Greg Whiteley also captures the reunion with his other band members—three of which are still alive. The final scenes as they prepare for their show in London at the Meltdown Festival are exciting as well as nerve-racking. SPIRITUAL VALUE: Arthur “Killer” Kane died of leukemia soon after the band’s concert in London. He was certainly not a perfect person, but his flair for life and quirky energy are very inspiring and even uplifting. When he became a Mormon after his band split up, he also attained spirituality that made him more in touch with himself and the world around him—and also stopped him from thinking about alcohol all the time. Whether you knew a lot or nothing about him prior to this film, you will be teary-eyed during the announcement of his death. THE BOTTOM LINE: A lively, warm, and moving tribute to Arthur “Killer” Kane.